Last year when I first started to paint my nails to kick the nail biting habit, I wanted so bad to build up my stash quickly so that I had color choice. 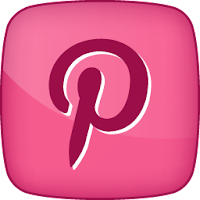 I started to scour clearance shelves or bins to find awesome brands like Essie for ridiculously low prices. This was one of those awesome finds. My friend Bailey found me this one for $2 on a clearance shelf and when she texted me and asked me if I wanted her to pick it up I sent back a very enthusiastic YES! 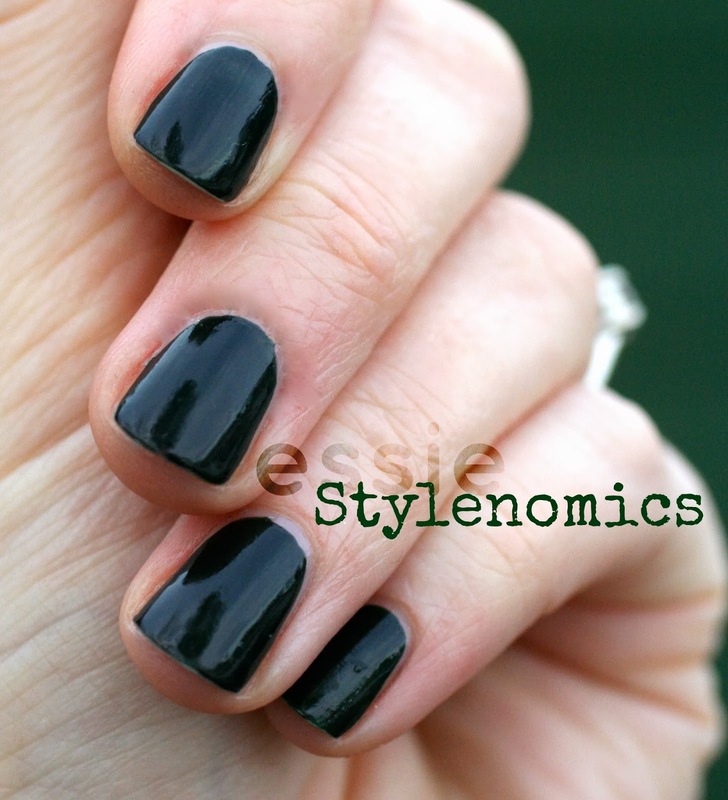 Essie Stylenomics is a blackened green creme that comes from the Fall 2012 collection. I love me a dark polish and I'm pretty smitten with dark emerald greens as well, so this color is pretty perfect for me. If truth be told, I do wish it was a little less "blackened" as to show more of the green color. 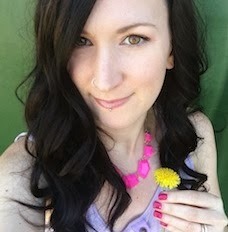 In low light (ie: indoors) it definitely looks like you are wearing black polish (although it's somehow less harsh and stark than straight up black), while outdoors in brighter lighting you can see more of the green tones. The coverage on this polish is fantastic. I only had to do one coat, although if you sport longer nails than me you would have to do two so as two completely cover visible nail line. I wanted more of the green to show and I knew 2 coats would make this darker, so when I saw the coverage I could get out of one coat I was happily surprised! This polish has a beautiful smooth application. For a dark color it was so easy to apply. 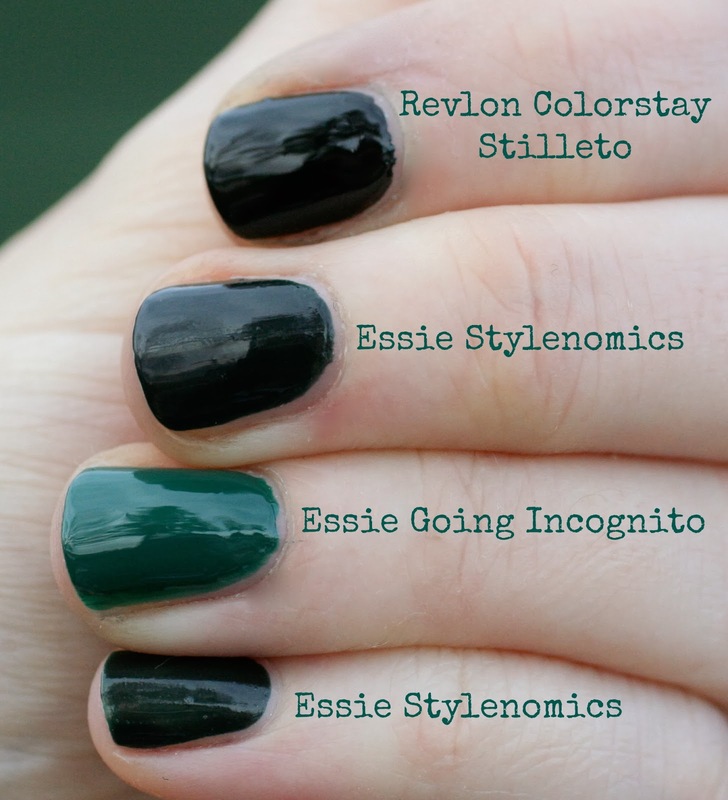 I wanted to show Stylenomics right next to a black polish and next to my favorite emerald green - Essie Going Incognito. The pics seem to show that Stylenomics looks pretty black next to a black! If you check out my pinkie finger, you can see how the 1 coat of Stylenomics does look like a darkened green though, and not quite so black. 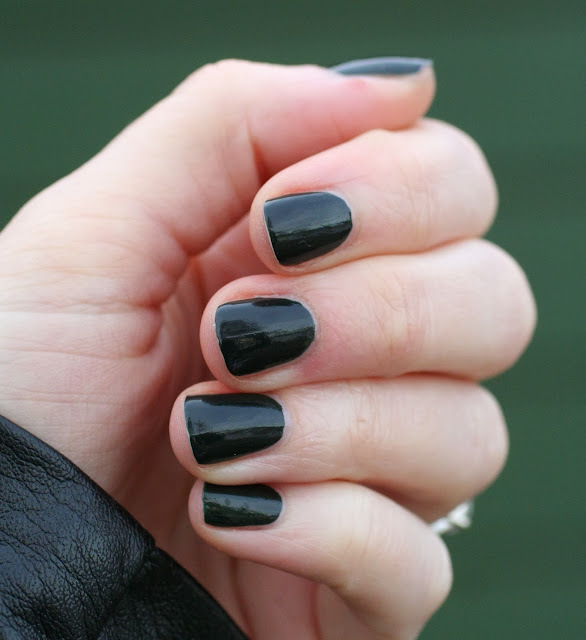 If dark polishes are your thing, then Essie Stylenomics is a fantastic one to own. Absolutely stellar formula. Hi Kin! I'm a secret Essie lover too. I don't have nearly the collection you do though. Hey I was wondering what your favourite polish remover is? I struggle with darker and glitter polishes.